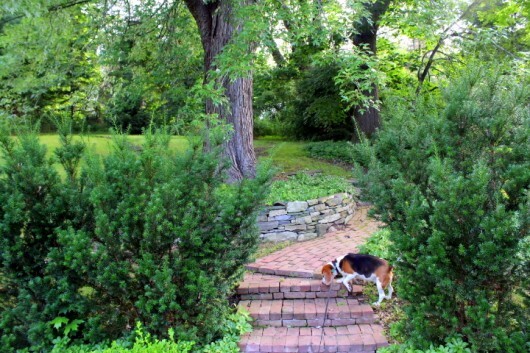 IN EARLY AUGUST, when Geranium ‘Roseanne’ (above) is in bloom, and the air is perfumed with Budleja and Clethra, I enjoy taking Lily the Beagle for afternoon walks. 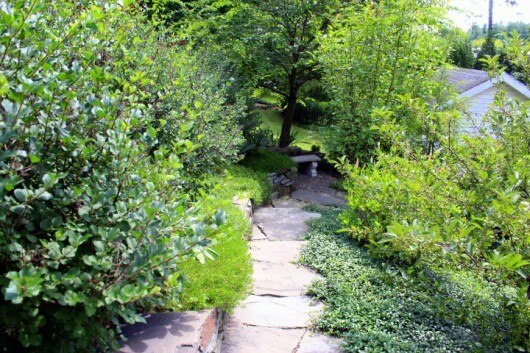 Would you like to see what we see as we stroll the various gardens here? Join us. Probably we should sip goblets of Sancerre as we stroll. 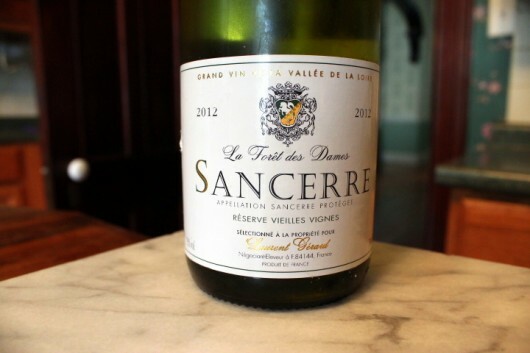 Sancerre, if you have not yet made its acquaintance, comes to us from France’s Loire Valley. 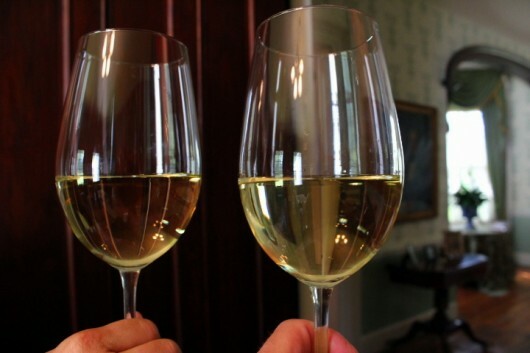 It’s a white wine that offers subtle hints of lime, lemon, grapefruit, flowers and herbs. It’s absolutely delicious. Swoosh! Here we are in the Rose Garden now. This 50- by 100-feet plot, was previously an asphalt parking lot. 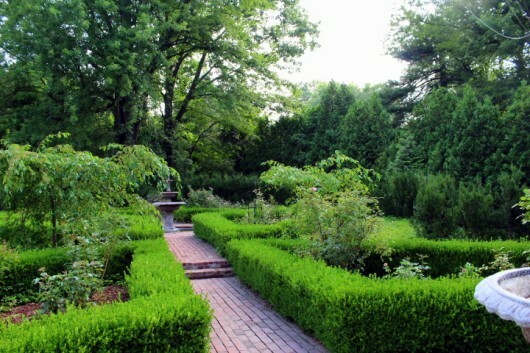 The garden is framed with 190 yews (Taxus hicksii), and 320 boxwood. I grew most of the boxwood from cuttings. I cut the roses back hard in mid-July, just as the dreadful Japanese beetles arrived. And guess what? Denied their favorite food (rose blossoms), the beetles abruptly departed. Frankly, I’d rather have rose-less roses than beetle-battered roses. Flanking the steps at the center of the rose garden is a pair of Malus ‘Red Jade.’ I planted these weeping crabapple trees 5 years ago. As you can see, Red Jade has produced a hefty crop of fruit. The tiny apples will be devoured by cardinals and other birds who like to spend the winter here. Lily the Beagle is insisting we head north. Let’s follow her up the hill. 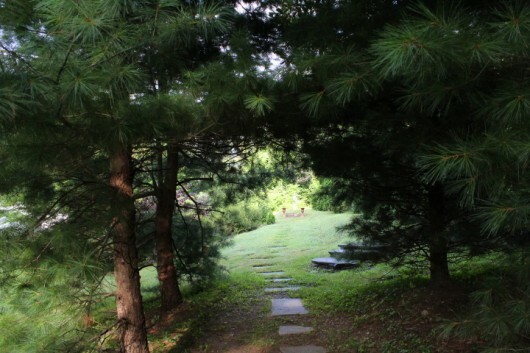 This blue-stone path will lead us to a grove of white pines. We are at the top of the path now, looking west through an opening in the pines. 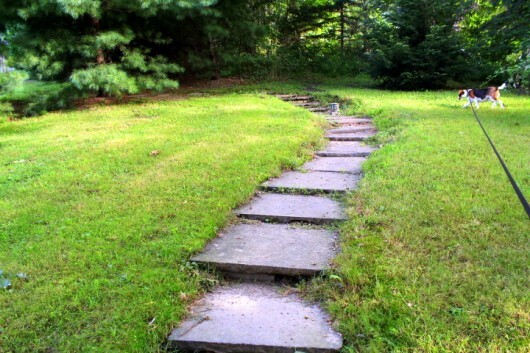 Let’s follow the field-stone path. 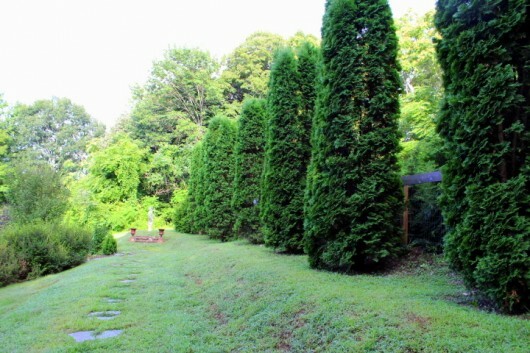 On our right, where they help to screen the swimming pool, is a long row of arborvitaes. I planted these 8 years ago, as 6-foot-tall specimens. Today they are 15-foot-tall skyscrapers. Tiny birds love the shrubs as much as I do. The evergreen boughs offer winter shelter and spring nesting quarters. At the end of the path is a statue of Venus de Milo. As most of you already know, Ms. Venus lost her head in a lawn-mowing accident. Making a right turn past the statue, we find ourselves in a wide clearing. On the right is the Pool Garden. Shall we open the gate and step inside? 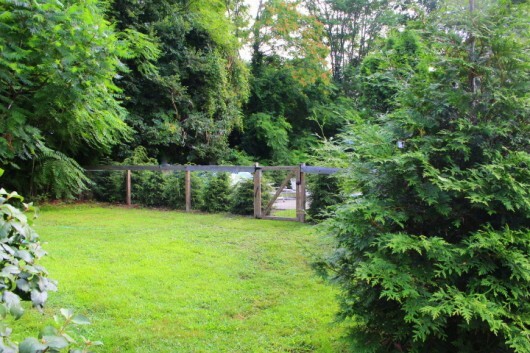 Three years ago we enlarged the pool area, and framed it with 40 hemlocks. 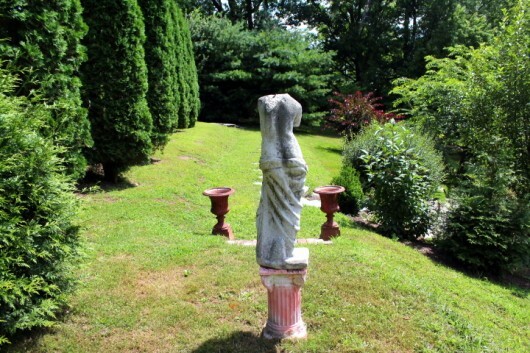 The hemlocks provide a green backdrop for the statues who reside year-round in the garden. 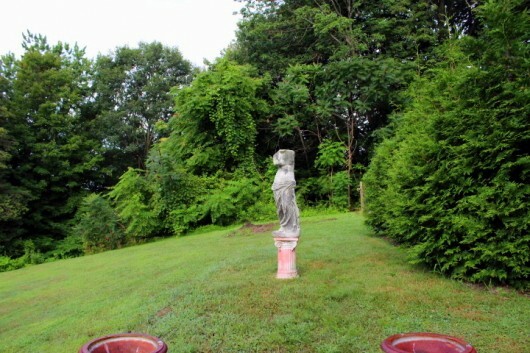 One statue — a Satyr — is wearing a petunia-hat. Tip: If you love petunias, do what I do, and take cuttings in August. Then you can enjoy the scented flowers indoors in winter. The details. I planted Baltic ivy, which is not invasive here, as a ground cover beneath the south row of hemlocks. Baltic ivy is one of the few ground covers which can handle full sun. It is also a terrific weed-barrier. Opposite the pool is the Kitchen Garden. I recently harvested my garlic and removed my tired, old strawberries. Hence the two empty beds. The zinnias in the narrow central beds are (finally!) in bloom. However, to my utter annoyance, they are not the ‘Royal Purple’ variety depicted on the packet of seeds I bought from D. Landreth. They are in fact a mixture of pink singles and doubles. Still, it’s better to have the wrong zinnias than no zinnias. And when they are first showing color. I now have a substantial crop of Butternut squash. 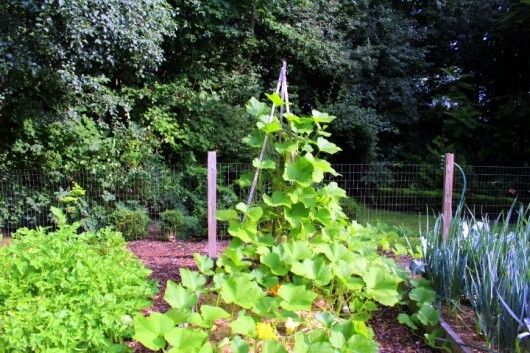 The squash, incidentally, has taken over an entire 8’x4′ bed, plus a tripod trellis. 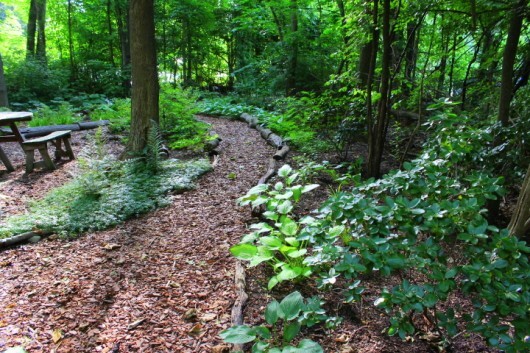 The Woodland’s curving paths are paved with wood chips, and edged with hostas and ferns. 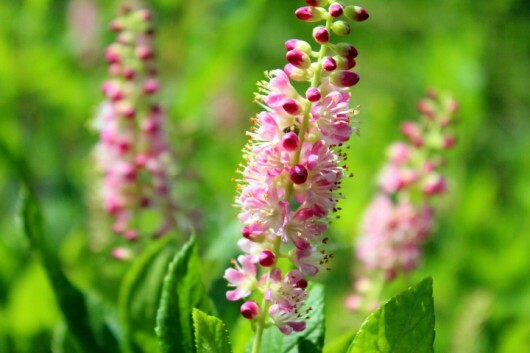 The only plant that is currently blooming in the Woodland is this luscious, pink Astible. Ready to walk? Let’s head back to the house, via the Serpentine Garden. As we approach the Serpentine Garden, we can’t help but catch a glimpse of Ms. Venus’ backside. 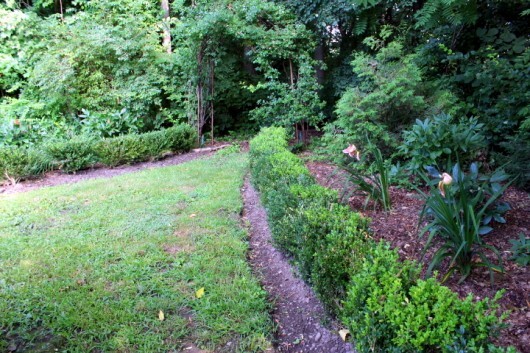 I designed the Serpentine Garden on a hillside that was too steep to mow (story here). We are descending the top terrace now. 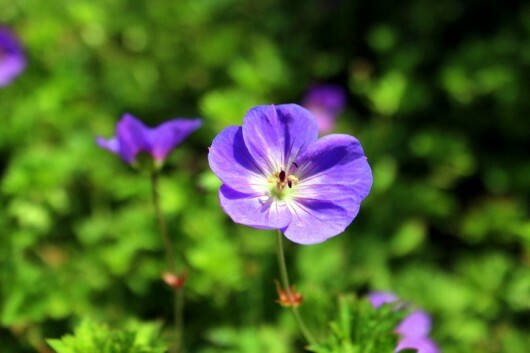 If you look to the left, you’ll notice the violet-blue blooms of ‘Roseanne’ (sometimes spelled ‘Rozanne’). This Cranesbill geranium increases in beauty with each passing year. 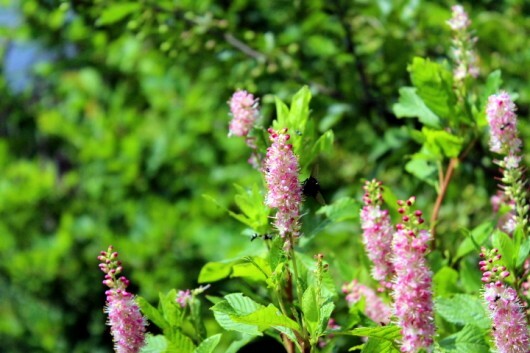 Do you have Clethra in your garden? I love the shrub’s intoxicating perfume. Also perfuming the air just now is a giant purple Budleja (or “Butterfly Bush”) that grows on the lower terrace. The honey-scented cones are attractive to every flying insect you can imagine. It’s fun to sit on the bench in the Serpentine Garden and watch the butterflies, bees, and hummingbird moths that visit the shrub. If you look carefully, you’ll notice a copper-colored hummingbird moth at the tip of a Budleja blossom. Well. I hope you enjoyed this little walk-about. 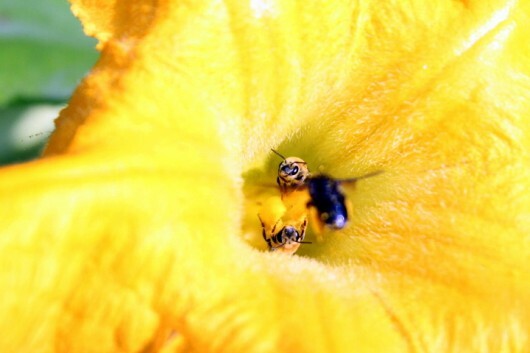 In the comments field below, tell me what’s blooming in your own early-August garden. As always, I love to hear from you. Thank You for the lovely walk. The wine was nice too. 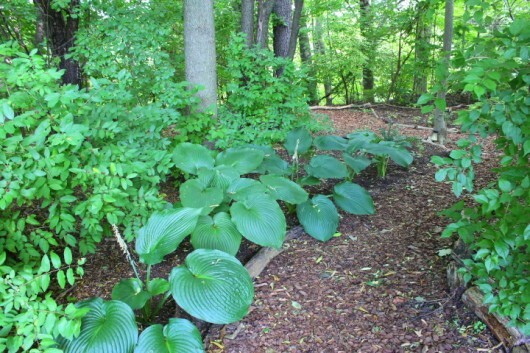 I have a shady area below the berm of the septic field, where I would love to create a woodland garden , but must consider what the deer will not eat. Sword Fern, I know. I wonder if I dare plant my seedling Dogwoods there, to glow along the edge of the forest and be lovely to see from the house? Or will I have to fence the wee things until they grow BIG? How lovely to walk with you Kevin, I especially prefer the woodland garden. 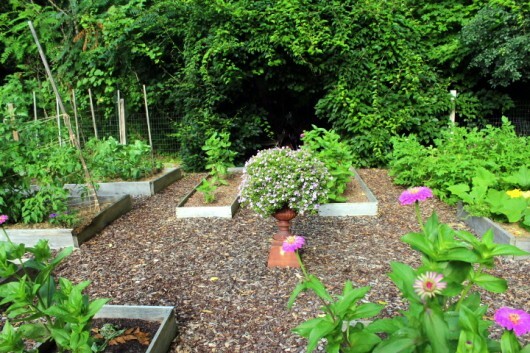 My back “garden” which faces east is so small the only blooms are the yellow flowers of cucumbers, tomatoes, zucchinis and squash, and the purply flowers on the potato plants. I did have roses on the backside of the house, but they are done blooming now, and a very large lilac tree, not blooming now either. I have tall shrubs all around the back yard that get wonderful smelling white flowers in June. Going along the south side of the house in a narrow dry strip between the driveway and the house, I have rosemary, sage, thyme and mint which have some flowers. And towards the front of the house on the southwest corner I have a big bunch of purplish pink coneflowers. Out in front, facing west, although I try every year to grow some flowers I always fail to grow much of anything there. Probably because I spend little time in the front of the house and they are sadly neglected there:) Over on the shadier northwest side of the house I have ivy growing and a rhodendrum bush that has beautiful red flowers in the spring. 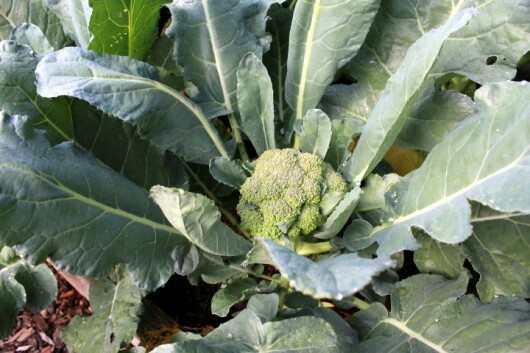 Don’t harvest the entire broccoli plant…just the central flower stalk. 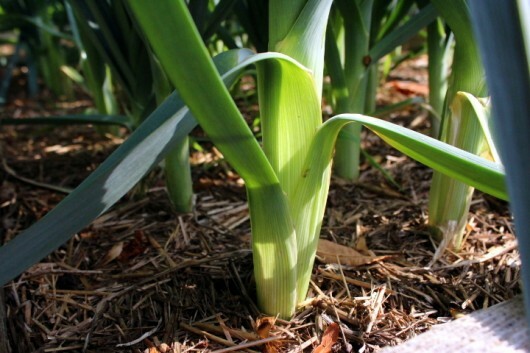 In another month or so, you’ll be able to harvest many, smaller, flower stalks growing from the sides. Thanks for the tour and the delicious vino (maybe next time you’ll offer me some alcoholic ginger ale to match the heat of the summer days?). Thank you for the wine and the lovely walk-about through your garden. I always enjoy our early Sunday morning visits, and your witty sense of humor. I live in California and my garden is quite small. I mostly enjoy perennials, and California natives. My fruit trees bear just enough fruit to make jams, jellies and various chutneys to enjoy and share with family and friends. Last week I made Vanilla Peach and Spiced Plum. The house smelled like Christmas in July. I collect pottery and you have inspired me to try keeping an inside winter garden, so yesterday, I planted eight beautiful pots with a nice collection of plants. Later today, I’m going to make your lavender cookies to share with herbal tea by the pool. Thank you for taking the time to share your life with us each week. I look forward to your emails. I, do, so, love to take a stroll through your gardens. I, especially love your woodland hide-a-way. 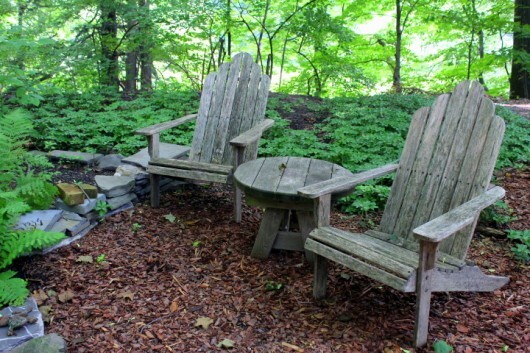 I want to build/make some pathways through my yard with mulch and cedar limbs as you have done.. I love the natural, earthy look. I think it is much more refreshing than a lot of man made items. Love your blog.. Thanks for sharing each time. Thanks so much Kevin! The Sancerre was divine, as are your wondrously gorgeous and prolific gardens. 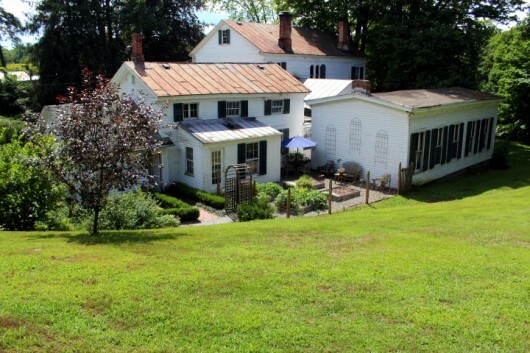 How many acres are your gardens? Those poor house “Kevins”, they sure have their work cut out for them! 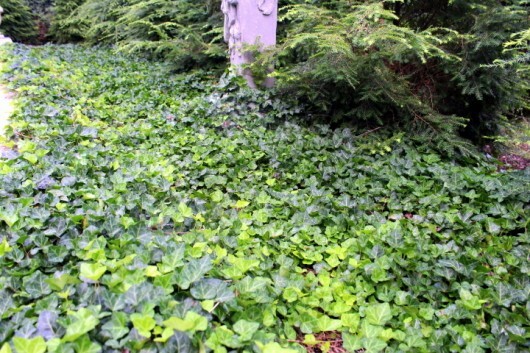 Love the ideas here, especially non-invasive Baltic ivy as weed choker ground cover. Will that ivy climb other plants? Thank you, Kevin, for the most delightful tour of your beautiful gardens. And since I’m not that far away, I hope to view them in person in a few weeks. Can’t wait to see Ms Venus and her friends in person. I love your house and gardens. They’re both incredible, as I’m sure the amount of time and effort you put into them as well! One thing I wanted to ask about was the comment I read where you’d indicated you should feed the plants in pots a little bit each time you water. I have several outdoor pots and wondered what you would feed them if they require daily watering? I’ll continue reading your blog, picking up what I can from our “master gardener”. Thanks for the guidance. Just wondering how you made your tripod trellis. Would it work for cucumbers? 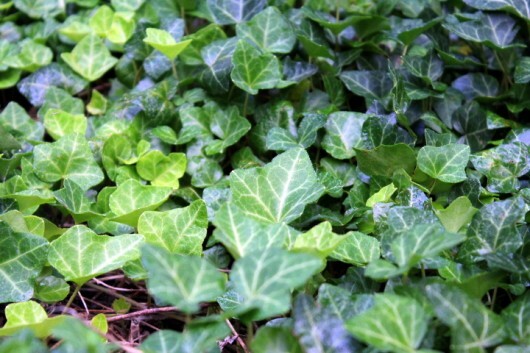 Hi Alyce – Baltic ivy is what I call a “ground-hugger.” Unlike other ivies, it doesn’t like to climb. Hi Joan Handy – So glad you liked the tour. Yes, I feed my outdoor potted plants with every watering. I use Jack’s Classic 10-30-20 formula, at the rate of one 1/2 tablespoon per gallon of water. Love the “servants all named Kevin ” comment, make me giggle. Love your projects! Blooming now in OKlahoma is my perennial hibiscus, big and blowsey and RED. Sometimes I get what I want and then some. I made your lavender cookies with my grandaughter substiting chopped lemon verbina from my garden and grated lemon peel. They are the best cookies in the world! Thank you for your marvelous blog. 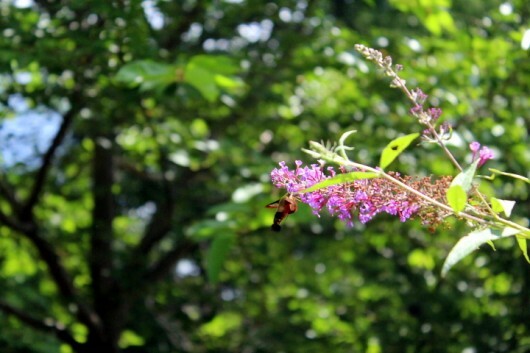 Front yard has butterfly bush and rose of sharon on one side of the drive way and mint meadow on the other. 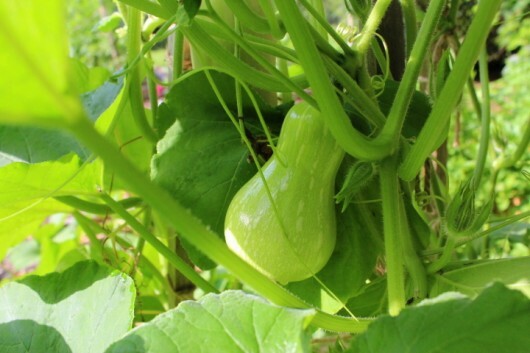 Squash, cucumber,nasturtium, eggplant, and asparagus peas are all blooming in the vegetable gardens. Flower gardens have roses (round 2) in neon pink, cone flower, pink malva, coreopsis, day Lillie’s, zinnea, snapdragon, and self -seeded cleome everywhere! I spent a good part of the winter planning a better garden and I’m happy to report that it’s paid off. 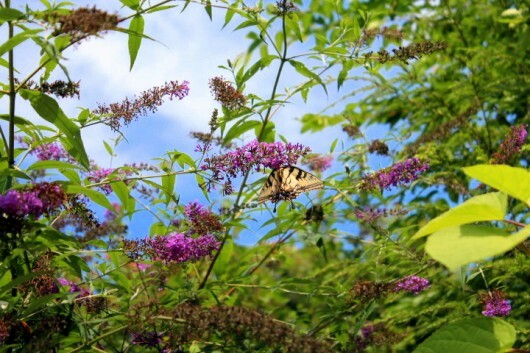 Hi Kevin – I live in Michigan and also have a butterfly bush. We have noticed the hummingbird moths and had no clue what they are. I have never seen one in Michigan. Thanks to you, I can now identify them. Thanks for the tour. Lovely walk! And a perfect wine, I’m sure. 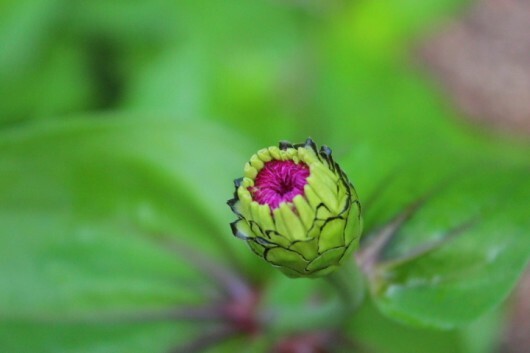 Good to find another zinnia zealot. 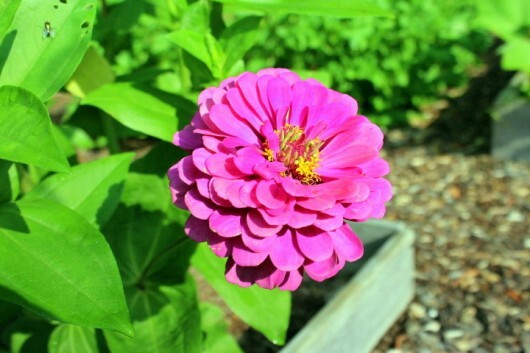 My Dreamland zinnias I hoped would be pure pale pink are more hot shocking pink, but still fun. The Queen red lime are new and fun…lots of interesting color variations. Just harvested the corn and froze it. 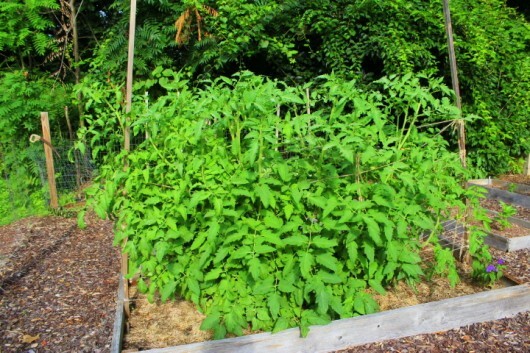 Tomatoes are fewer this year, but taste better, so that’s just fine. Your place is so beautiful. Thank you. Thanks you for the tour again! 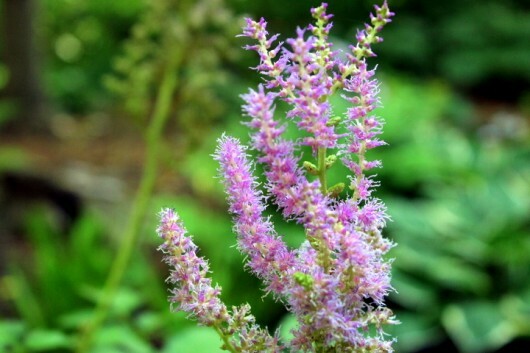 As you were describing the insects on the butterfly bush I had to think about the Anise Hyssop and wondered if you ever tried it. It attracts all kinds of insects and butterflies, even more than the butterfly bush. It blooms in lavender, has a interesting scent and I enjoyed it for about 3 years until it finally just got smaller and then disappeared. I did research and seems nobody else had problems with it like I do. Some people even report how it drops seeds and increases! Not for me. Well, I just wondered, if you ever tried growing it. Thanks for all your wonderful advice! Karin W. – I winter-sowed hyssop last January. Every seed germinated. But…I left the seedlings in their milk-jug container until only a few days ago! 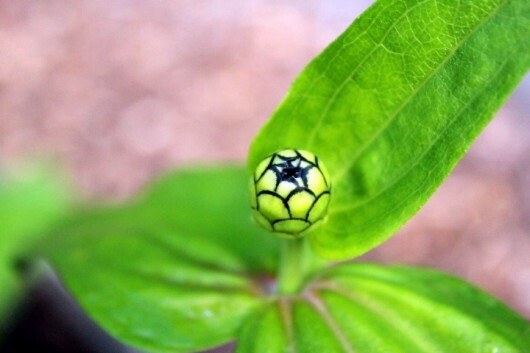 Nice to know this herb will eventually attract butterflies, bees, and other beautiful insects. Kevin, thank you for the walk thru your gardens, what a pleasant trip. 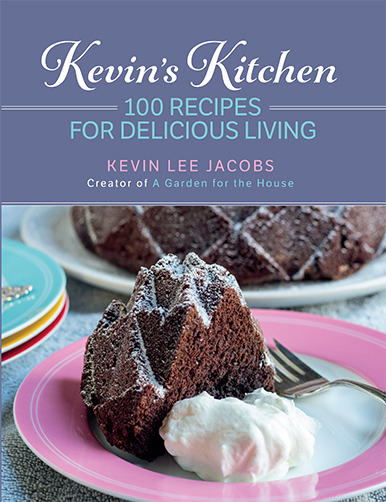 How do you do it all, Kevin? You are a a miracle worker. Kevin, your gardens are amazing, as always. Here I’m still struggling to get my tomatoes to do anything; I do have some prolific herbs (only basil, mint, and sage), and random flowers luckily doing their thing with no input from me. 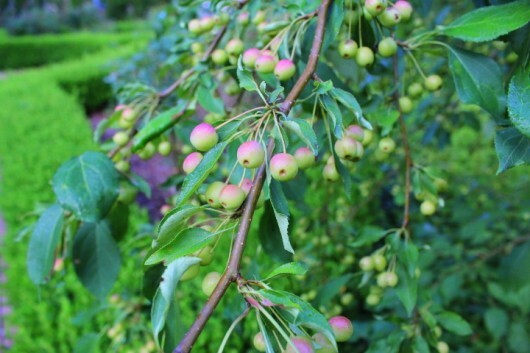 We had a bizarre windstorm this past spring right when the fruit trees were in full blossom and lost all the blossoms and as a result the fruit, so our normal cherries, apricots, and applies are nearly non-existent. Any suggestions for what to be planting now for fall?!? You do such a wonderful job of “sharing yourself” that I actually think of you as a friend rather than just some anonymous guy’s blog I follow, so I thank you for that! I as well am an aspiring blog writer but I’m still new to everything. Do you have any tips and hints for beginner blog writers? I’d really appreciate it. Hey Kevin…. All lovely as usual. Regarding Japanese beetles… I have removed all my hybrid tea roses in the past five years and replaced them with the old garden roses that flower but once a year… Gallicas,, Albas, Bourbons, etc… They are hardier, deliciously fragrant, disease resistant… And all finished flowering by the time the beetles make an appearance. Of course, I also have a few David Austin roses … I can’t go all summer with no roses to cut! I also have a question for you. Regarding taking boxwood cuttings for rooting. Do you think it’s too late in the season to do this? I garden in South West France. I think we’re lucky enough not to have Japanese beetles here to eat our rose blossoms. They do (the roses) have a rest during the very hot weather but are coming back into flower now. Geranium Rozanne is spreading by the year, about 5 foot across now. The catalpa (from northern america) has finished flowering and is now busy making beans. The climber campsis is smothered with big, orange, trumpet-shaped flowers. Gauras are very popular here and do so well in all sorts of soil. 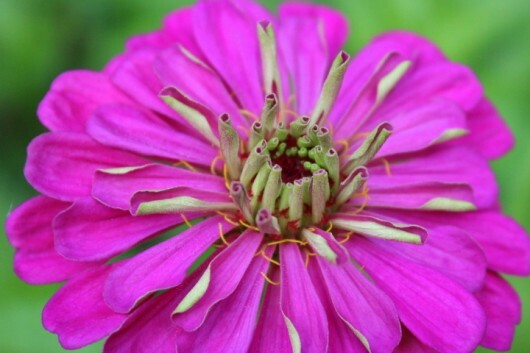 Love your garden and blog – thank you. Thank you for the trip round you beautiful garden. I enjoyed the sights, sound and aromas but most of all I enjoyed the wine and the company. PS So sorry that your roses had to be cut right back.. Better luck next year. A lovely walk as usual Kevin, here in Northern Michigan I enjoy sitting on the front porch watching the hummingbirds at my crocosmia lucifer each morning as I have my coffee. Joe Pye is close to bloom,cloeme,and the glads are starting to send their flower stalks skyward.It is a lovely time of year, the calm before the canning/freezing storm. Thanks again for your lovely walk. blog soon but I’m having a hard time choosing between BlogEngine/Wordpress/B2evolution and Drupal. The reason I ask is because your design and style seems different then most blogs and I’m looking for something completely unique. I’m vicariously enjoying the garden stroll this week while here recovering from knee replacement surgery. Your garden just spectacular! My little garden patch was deliberately small this year knowing I would be laid-up…a couple of tomatoes, lots of basil and arugla (easy picking) and some green beans with a few random herbs. The patio needs a little weeding…but a dear new neighbor helped me plant a new row of hosta and cone flowers along the driveway where she had removed a rotting picket fence and added a row of winter berry bushes. Another friend coming for lunch on Wednesday will help pull a few of the weeds on the patio. You really know who your friends are when they’ll help with the garden chores! Your e-mail is now a regular part of Sunday morning, along with a leisurely cup of coffee, the NYT and Valley News. And for Schwimmbecken gfk, if you look at the bottom of the page you can see this blog is powered by: WordPress & WDS. What is WDS Kevin? What a wonderful tour of your gardens! My daylilies, lilies, double cosmos, Russian Sage, Black-Eyed Susans, Blue Balloon Flower, zinnias and Clematis are blooming full blast right now. My hundreds of varieties of Hostas are in full leaf, tho some of them have lost their bloom stalks to munching deer. I’ve been picking about two pints of raspberries every day or two. I wrote to you before of how to keep the squirrels from eating my raspberries. I never got around to putting in an electric fence, but there is a plastic fence 4′ high totally around my raised beds which have tomatoes, lettuce, beets and the raspberries planted in them. Last year the squirrels climbed that fence and feasted on my raspberries before I managed to get out and pick any. The plants have produced so many more fruit this year that there’s enough for both me and the squirrels. I’ve started freezing the berries, since we can’t eat them fast enough. Wow Kevin What a beautiful garden you have. I’m envious. 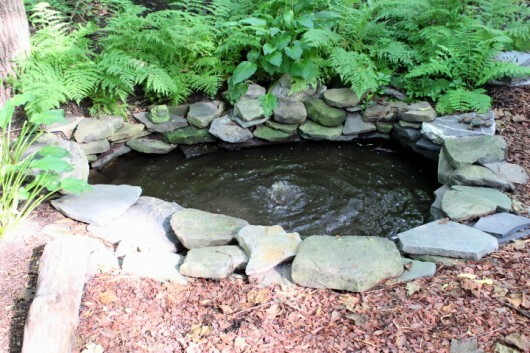 I just want to come and sit by the fish pond. Thanks for sharing. Hi Kevin: Very, very interesting that you prune your roses to thwart the Japanese beetles!! They are a very big problem for me this year and I was going to trash my rose bush (3 ft x 8ft) even though you can smell that beautiful rose fragrance from my deck!! I was actually picking them off and putting them in soapy water as you suggested but that’s too much work for me so I’ll get the shears out. At least I can keep my rose bush and still enjoy that fragrance early in the season. So glad I came across your blog. I employed your newspaper/mulch idea to good effect and now this….you saved my roses!! Lovely tour, Kevin. Are you sure you don’t have at least ONE gardener working with you to maintain such gorgeous gardens? Don’t be holdin’ out on us now! I just can’ t imagine how many hours a day and days a week you spend in them. I hope you take a long, relaxing vacation once in a while! Thanks for the lovely walk and the delicious wine! My roses were ravaged by Japanese beetles. I finally cut off all the flowers and just as you say, the beetles have gone. But will they be back next year? 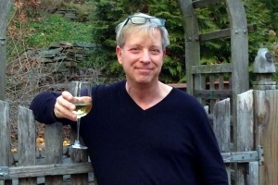 Kevin, Thank you for the wine and the lovely walk through your garden. What a delightful visit! So many beautiful plantings and a wonderful variety of gardens. Please don’t stop … I enjoy every post … it makes my day. Sometimes I save your blog to read when it is very quiet and I feel as though you are just talking to me! Luv, luv, luv! Thank you! A beautiful walk indeed! Thank you so much, Kevin, I felt like I was right there. This Florida weather does not make for the same landscape as you have. 🙁 But I am planning my fall garden with hopes of some harvest! Please keep up the tours! Love them and you for sharing! So all your servants are named Kevin? All my servants are named Beverly. Lovely garden with peaceful residue! The only thing that’s blooming in my yard are the gardenias and that’s because someone else planted them. When they refurbished our apartments they also landscaped so I’m really proud of my modified yard. 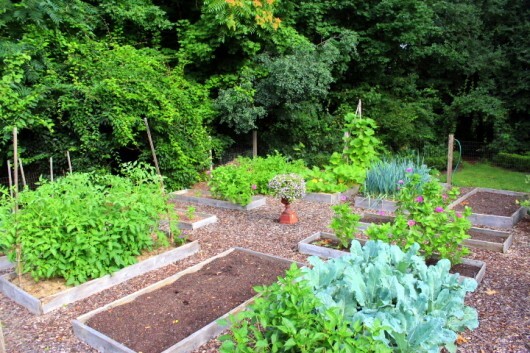 Your garden is nice my favorite part is the part where you grow vegetables. Thanks for the tour. I wipe down my door knobs at least once weekly year-round but especially during cold and flu season. I wipe the outer handle upon entering the room and the inner when leaving. It’s so habitual now i don’t even think about it. I love, love, love your garden pictures! Do you rent out your garden for pictures? Just wondering, because they would make beautiful back drops! How I love strolling with you in your garden! What a heavenly retreat! Didn’t have a Sancerre on hand so I settled for a refreshing Pinot Grigio and sipped while scrolling down (I meant strolling) the path with you and Lily. This has become one of my favorites; now before I settle down I check what you are serving and try to match it. 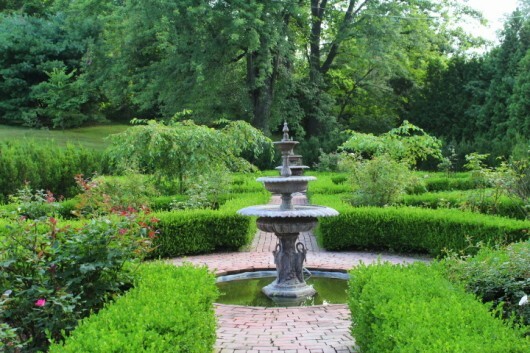 I love the feel of your garden and how formal( rose garden) blends with nature (woodland garden) . It is sublime. As for my Arizona garden, not much grows at the moment; we had temperatures of 113 in July, down to 105 today. Charentais melons are abundant this year , enough to freeze for later use in sorbets or smoothies. August is blooming barrel (cacti) time and my cacti garden is exploding with color (from yellow to deep red). For desert gardeners this is the time for Fall garden planning, feeding/mulching the kitchen garden and adding cacti to the desert gardens; I’m forever adding/moving rocks (big and small) until I get the right feel. The days start at 4:30am with a cup of very strong coffee then it’s gardening from 5:00am until I can’t take the heat any longer. Desert gardening is an adventure! Eagerly waiting for our next stroll. Your gardens are just beautiful and I enjoyed how you took us on a walk with your writing. It’s been two years since you wrote this and I hope whatever is new is pleasing.